Steel Panther are bringing their celebrated live show into 2019 with the Heavy Metal Mardi Gras Tour. The new dates kick off March 1st in Jacksonville, FL and will currently run through March 8th with more dates to be announced in the near future. The new tour heads in to the South and will make stops in Birmingham, AL; New Orleans, LA; and Nashville, TN among others. 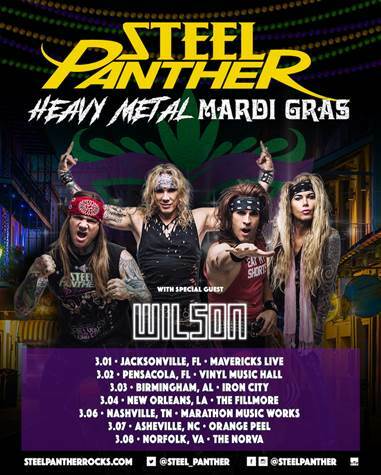 Fellow party animals Wilson, who have toured with Steel Panther in the past, will return as special guests for these new dates. These dates will follow the previously announced run in November and December. All ticket and VIP package info can be found at: http://steelpantherrocks.com/tour/.